Underwater welding, also referred to as wet welding, is the practice of completing welding tasks underwater. Underwater welding is a process in which metals are welded together in order to repair an already standing immovable structure, exactly the same processes land welding minus the water. Though the concept is the same there are more variables, dangers and other elements; this means not only is the water a concern in conjunction with electricity but the pressure as well. Welding underwater is only done if it is necessary; there are many scenarios that leave underwater welding the only repair option. Damaged metal bridge posts, boats, oil rigs, and various other objects that can’t be easily removed from the water. A very risky and demanding job, but it is almost always in demand which is a rare positive quality. 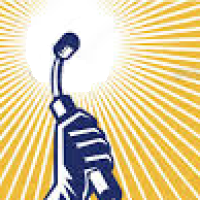 A career path in this category will continuously be plentiful for possibilities and earning. To become an underwater welder, one must first obtain their high school diploma or GED and then gain surface welding certificates and related experience. Following this, a commercial diving jobs application can be submitted to attend a technical institute to gain the diving certifications needed for the position. Finally, you can get an underwater welding job and perform your duties while also getting better at your job. Swimming and scuba classes also help, and open water certification should be gained on the way to continuing your welding shop experience. To become an underwater welder, it is important to gain certifications and specific skills in three areas including surface welding, commercial diving, and underwater welding. Underwater welding is a very necessary but rare skill and the base pay can be around one hundred dollars per hour. Of course, the monetary rate depends on the task itself and the depth of the location. It requires a high degree of skill in both welding and diving. According to commercial divers and global statistics the approximate starting pay per year is approximately $54,000. However, those underwater divers that fall in the bottom 10% only make around $30,000 per year on average, but the top 10% can see a salary upwards of $80,000 annually. In order to provide this service, you must not only be trained in welding skills but also scuba diving. There are several academies that offer both certifications paired together, obviously, they are tailored towards underwater welding specifically. Not all companies hiring underwater welders have the same qualifications for employment. This is something you don’t need to go to a four-year college for and the more hands on experience you have, the better you are paid. If you are interested in serving your country, the Navy also offers training within this category also. CDI is one of the top schools in America for underwater welding. There are a lot of offshore oil rigs with pipelines that travel through various depths of the ocean. They always need constant monitoring and repair. Most are aware, after seeing the BP oil spill a few years back, how detrimental oil leaks can be to nature. 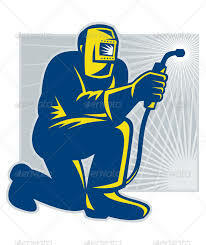 Welding is a way to secure broken or weakening metal and keep leaks at bay. It is common knowledge that welders, in general, make a lot of money, and underwater welders make even more because of the difficulty and limited specialization of the industry. Typically, an average underwater welder’s salary can range from twenty-five thousand dollars to eighty thousand US dollars because of the necessary skills needed for the job. Though more advanced and experienced welders can earn as much at three hundred thousand USD. The pay is shockingly competitive, and even more enticing is the fact that you don’t have to work year round, most of these numbers are based on a six-month work year. Underwater welding is a service that is needed all over the world, so the options are limitless with where you can live or travel to for a job. Not only is the location adaptable but if you get tired of welding itself it is easy to become a teacher for those who want to follow the same path. There is no age limit on who can hold this job, the only concern is strength and physical ability to complete the job. A special physical needs completed before you can qualify for the job allowing your stamina, not age, speak for itself. 6. What tools are necessary? Welding underwater exposes the worker to the dangers of electricity. They typically use three hundred or four hundred amps of electric current to power their tools. The most common form of welding they use underwater is Arc Welding. Using a stick electrode is almost like recreating the process of dry welding though they have the feature of cooling the water and safer insulation. The tool heats the target and rod and forms a bubble that spawns from the deconstruction of the electrode coating. They transfer metal drops similar to the use of glue but on a more powerful scale. The main risk of taking on a job in the underwater welding field is being in the way of an electric current. The risks decrease, as with anything, when you become more aware of your surroundings and environment. Working underwater always brings pressure related risks. Decompression related illnesses involve the amount of pressure and gases you will breathe while completing your job. In rare cases, there can be more severe effects involving the musculoskeletal parts of the body. The welding process seems complicated, especially having to complete the job underwater, but it can be laid out very basically. The first step like in most jobs, is for you to figure out what materials you are welding together or repairing. This determines what you need and how you complete the task. Since the job takes place in an unsafe underwater environment, everything must be planned on land  From tools to the procedure. It’s very important to know the order everything must be completed. Now get in the water. Don’t waste any time under the water and remember you have complete control over your power source. Only turn it on when you need it that second. If you come across any conflict you have control to off the power source immediately. When you do finish make sure you shut off your tools. Keeping the mechanism off as much as possible is the main goal and will help keep you safe. The issue of safety is a theme with every step in every bit of training or procedure. Water and electricity and dangerous components to handle at the same time. For welding underwater there are three possibilities to use in order to move heat. The Cathode, Anode and Plasma. On the outer shell of the metal is water proofing, and in its center is core wire. A little past the outer coating is the flux coating. A bubble shield is created between the two pieces of metal with a chunk of weld deposit and it encases metal and slag droplets. 10. Bubbles are your friend and may save your life. Bubbles are important when underwater welding. A large gaseous bubble typically forms around the arc and is the main protectant. Its consistency is seventy percent hydrogen, twenty five percent carbon dioxide, and five percent carbon monoxide. Bubbles are created by the burning of the flux creating chemical reactions. Though the bubbles created help the welding process, they can also cause trouble. There are always more bubbles produced than needed and being underwater creates an uncontrollable and unstable environment; therefore, the bubbles often fly upward and block visibility. These bubbles could also increase the risk of a failed mission and a final result of it all collapsing. 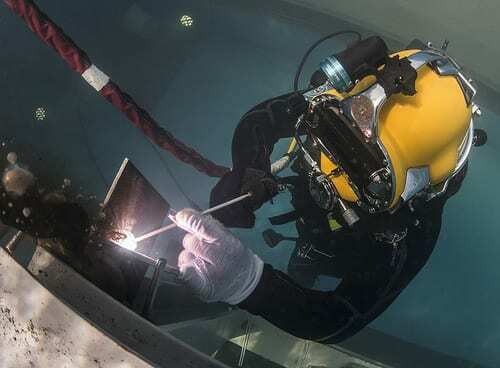 Underwater welding can make quite the adventurous and fulfilling career as long as safety is always made the first priority. The deep underwater environment poses its own set of challenges and many underwater welders may find themselves in a constant battle with these conditions and many deem underwater welding as one of the more dangerous jobs. They are subject to having to hold themselves in place even against strong currents, they have poor visibility to contend with, equipment failure, decompression sickness, and even some undesirable encounters with underwater sea life. Training is the number one thing to focus on after safety when it comes to an underwater welding career.